October 2, 1938 –A squad of police rescues Cubs manager Gabby Hartnett as he tries to find his family at the Illinois Central station as the team returns from St. Louis where it wrapped up the National League championship. The police take Hartnett to a fire department car and spirit him away from the crowd. In the meantime, Cubs pitcher Dizzy Dean finds himself surrounded in a parking lot as he looks for friends who had promised to pick him up. The fire department again comes to the rescue, rushing Diz and his wife away in car. The Chicago Daily Tribunereports, “Other Cubs got similar treatment. But the scene was fresh out of rescuing fire marshals, so they had to fight their way to cabs which had been pushed back far from the loading pavement.” [Chicago Daily Tribune, October 3, 1938] Railroad platforms arre crowded all the way home from St. Louis, but the players are unprepared for the huge reception near midnight when they return to the city. 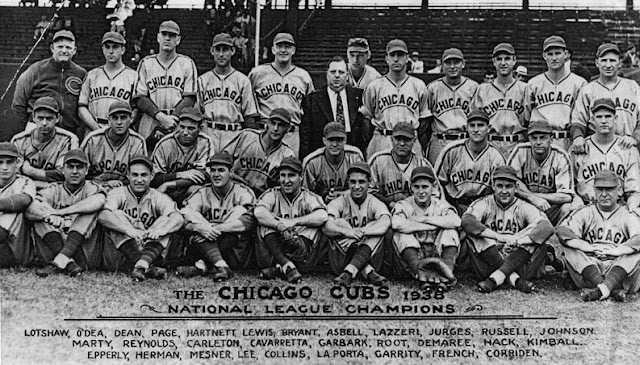 The Tribunereports, “Most of the Cubs are small town boys and know that small town folks like to go down to the station on any pretext. They never dreamed that Chicagoans would go down to a station to look at ball players they can see any one of seventy-seven days in the regular home season. They really were surprised when they faced that mob last night.” Perhaps there was a bit too much celebrating … the New York Yankees swept the Cubs in the World Series that followed. October 2, 1906 – As a result of city council action regarding the regulation of cold storage companies adopted shortly before, 20,000 pounds of canned chicken at the North American Cold Storage company are condemned because they were “utterly bad.” [Chicago Daily Tribune, October 2, 1906] The company claims there is nothing wrong with the frozen birds, but city officials from the health department disagree, so “seven big policemen are now on guard to see to it that nothing goes in or out of the warehouse.” As part of the tussle the warehouse’s manager, A. F. Denham, is taken to the Des Plaines Avenue police station in a patrol wagon. The conflict begins a week earlier when the health department labels 50,000 pounds of canned chicken at the North American company and the A. Booth & Co. as suspicious. The health commissioner does not take long to arrive at a conclusion, noting that when samples were thawed out the smell “was so nauseating it was necessary to drench them with formalin before they could be handled.” A rendering company was called, and the Booth plant handed over 30,000 pounds of poultry without protest. Things proved different at the North American warehouse on Canal Street. From 10:30 a.m. until 1:00 p.m. Denham confers with health department officials and his lawyer, finally notifying the city that the lawyer has advised him to stand his ground. Police are summoned and warehouse employees tell them to take the elevator to the top floor where the questionable poultry is stored. Someone apparently tampers with the elevator and it stops on the sixth floor, leaving the officers in the dark of the freezing warehouse. They are forced to climb down six floors of ladders in order to make their way outside where “their feelings were ruffled.” They find Manager Denham in his office beside a menacing bulldog. Denham is arrested and booked on charges of resisting arrest. 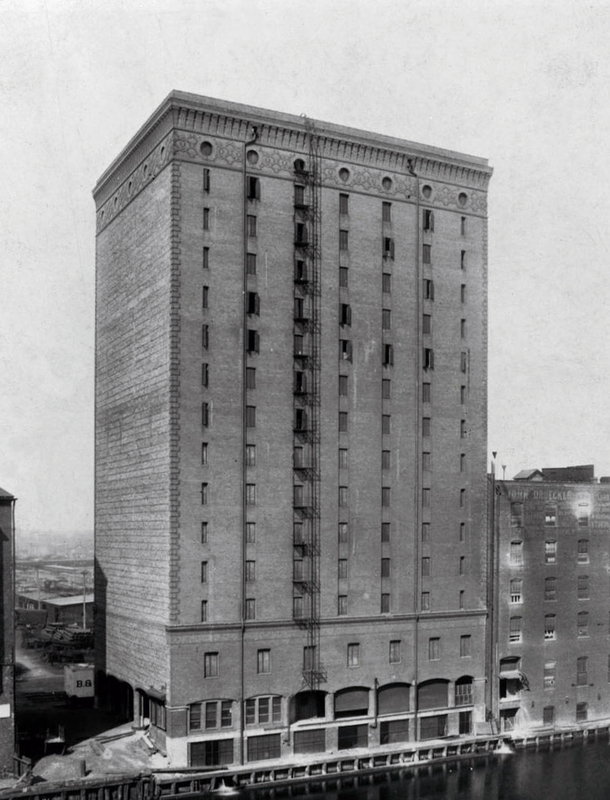 All afternoon wagons arrive with goods to be stored in the warehouse, but the officers are resolute, “a trifle overzealous in the matter on account of the experience … on the sixth floor.” The addition to the North American Cold Storage Warehouse, completed in 1908, is shown above in the 1910 photo. 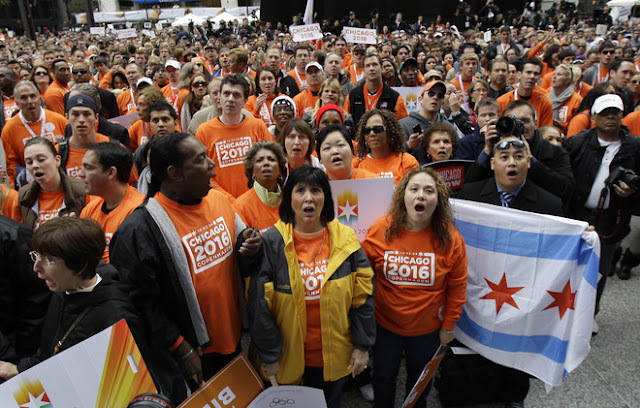 October 2, 2009 – Expecting to revel in the news that the city had been awarded the 2016 Summer Olympics, thousands of Chicagoans pack the Daley Center plaza. It is not to be. After a three-year effort in which thousands of volunteers participated and into which 72 million dollars in donations had been poured, the news that Chicago is out of the running is delivered by 10:15 a.m. Chicago does not even make it to the second round of voting despite a last-minute plea from President Barack Obama and lobbying of the members of the International Olympic Committee by Oprah Winfrey. Mayor Richard M. Daley, who had worked as hard as anyone to make Chicago the Olympic city, said, “We’ve come on a long journey, but the city is better for it . . . Sure, you have tears, you get disappointed – you’re human like anyone else.” So . . . it was on to Rio in 2016. Rio without tears.